You do not have to be envious of people who have silky, shiny and picture perfect hair, because you can have it too. Soon you too can show off with your hair among your friends. Protein penetrates deep into your hair shaft, making your hair shine and grow. 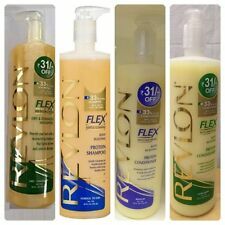 Original Revlon Flex Shampoo or Conditioner with Panthenol - 592ml / 20oz. Lot of 2 vintage Revlon Flex Balsam & Protein Extra Body Shampoo, 11 fl oz each. New old stock. Original made in U.S.A. Pictures are of actual items. Revlon Flex Triple Action Extra Body Shampoo. 18 ounce bottle is nearly full, may have evaporated. By purging out the impurities present in your hair, this Revlon Flex Shampoo cleanses your scalp and hair efficiently, thereby making your hair healthy and refreshed. The Revlon Flex Body Building Protein Shampoo grants your wishes by rejuvenating your hair. Vintage Revlon Flex Normal to Dry Shampoo and Regular Conditioner set, 11 fl oz each. Original made in U.S.A. New old stock. Both the shampoo and conditioner seem to have thinned a bit from age. Pictures are of actual items. REVLON FLEX SHAMPOO CONDITIONER. Protein based shampoo. This exclusive Flex formula is well balanced and gives hair more bounce, great body and beautiful shine. It Gives normal to dry hair more bounce, great body, beautiful shine. Protein penetrates deep into your hair shaft, making your hair shine and grow. This Revlon shampoo will help rebuild hair structure and achieve the lost hair health. SHAMPOO CONDITIONER. Fortifies with pro-Vitamin B5 to thicken hair. Nourishes with a unique smoothening protein complex to provide instant de-tangling and extra shine. This Revlon shampoo will help rebuild hair structure and achieve the lost hair health. If you wish for long and voluminous hair, here is a solution. The revlon flex body building protein shampoo grants your wishes by rejuvenating your hair. This nourishing shampoo is suitable for normal and dry hair. 2 - 11 oz. - easy to comb. This unique, patented formula shampoos and conditions in just one step. Leaves hair Flex clean, Flex Manageable, alive with unexpected body and shine. A seperate conditioner is not necessary. By purging out the impurities present in your hair, this Revlon Flex Shampoo cleanses your scalp and hair efficiently, thereby making your hair healthy and refreshed. In addition, the body building shampoo boosts cell growth and makes your hair appear lustrous and full. Well nourished hair is always more flexible! Revlon introduces Flex Shampoos and Conditioners for hair that look gracious and full of life. Put an end to all those hair worries with this revolutionary shampoo. Date format used in India is DD / MM / YYYY. price or mark international parcels as "gifts". 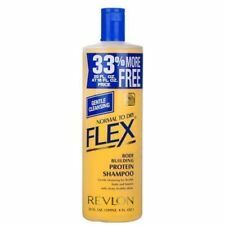 Revlon Flex Body Building Protein Shampoo Normal To Dry. 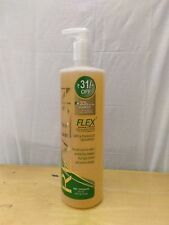 Revlon Flex Body Building Protein Shampoo Normal to Dry Free Worldwide Shipping. Date format used in India is DD / MM / YYYY. price or mark international parcels as "gifts". Custom Policy. • We are available 24 7. By purging out the impurities present in your hair, thisRevlon Flex Shampoo cleanses your scalp and hair efficiently, thereby making your hair healthy and refreshed. In addition, the body building shampooboosts cell growth and makes your hair appear lustrous and full. 1 - 11 oz. - easy to comb. This unique, patented formula shampoos and conditions in just one step. Leaves hair Flex clean, Flex Manageable, alive with unexpected body and shine. A seperate conditioner is not necessary. Revlon Flex Volumizing Shampoo With Keratin. 650ml. For fine or low density hair. Spanish text. 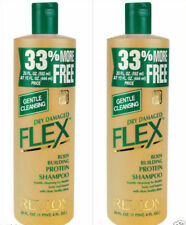 REVLON FLEX SHAMPOO 592 ML. Protein based shampoo. Leaves hair feeling more supple, more manageable and looking radiantly healthy. This exclusive Flex formula is well balanced and gives hair more bounce, great body and beautiful shine. 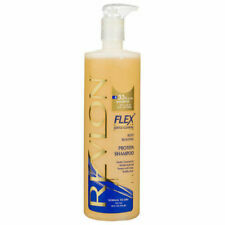 REVLON FLEX SHAMPOO 592 ML. Protein based shampoo. This exclusive Flex formula is well balanced and gives hair more bounce, great body and beautiful shine. Composition: caribbean fragrance. Suitable For: Normal Hair. Soon you too can show off with your hair among your friends. Protein penetrates deep into your hair shaft, making your hair shine and grow. This Revlon shampoo will help rebuild hair structure and achieve the lost hair health. This exclusive Flex formula is balanced for through yet gentle cleansing. With Flex you get highly effective cleansing without stripping. Rinses away clean. Leaves hair feeling more supple, more manageable and looking radiantly healthy. This Revlon shampoo will help rebuild hair structure and achieve the lost hair health. Protein penetrates deep into your hair shaft, making your hair shine and grow. we may use different services as per the convenience. Revlon Flex Shampoo or Conditioner with Panthenol - 592ml / 20oz New Original.